From being considered vandalism to being accepted as an art form, street art is widespread on the walls, dumpsters, lampposts, and other outdoor convenient surfaces. 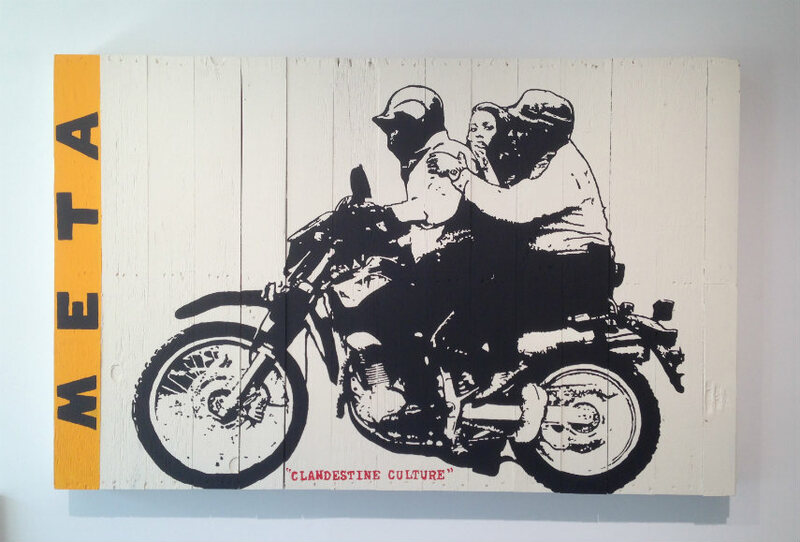 First solo exhibition of the anonymous street artist, known only as Clandestine Culture is the great example of bringing the street inside. Already recognizable in The Wynwood Art District in Miami, one of the largest open-air street installations in the world, Clandestine Culture excepted the invitation to show his work in the commercial gallery space. 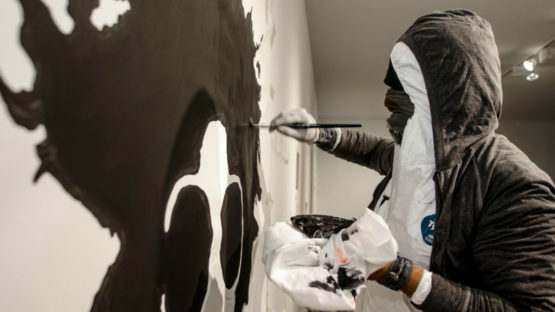 Wearing goggles, hoodie and scarf over his face, this artist wants to stay anonymous, in accordance with his belief that the painting and its message is more important than the artist. In 2008, caused by the economic crisis and encouraged by the murder of student girl, the riot broke out all over the Greece and spread throughout the world. Greek police were accused of brutality which went unpunished. While watching the news and following the stories about the riot, our artist was horrified by things that were happening and decided to create a hero – Clandestine Culture whose work carry the message that people should not allow themselves to be fooled by mass media. His characters represent the courage that one need to have to demonstrate to the world that they are Clandestine Culture. Gregg Shienbaum, the owner of the gallery, approached the man who was hanging the poster on a lamppost. He told him that he was interested in his work and propose him to exhibit in his gallery. The man was suspicious at first, but eventually, he accepted the offer, as long as he can continue to spread his message and keep his identity secret. The man was Clandestine Culture and he made a good decision, considering that his first sold work went to a French collector for 2000 American dollars. The exhibition was held in October 2012. He represented his black-and-white stencil-like portrait images with the red banner with the inscription Clandestine Culture, as statement and signature. These posters were the basic from which the artist started to upgrade his other works. 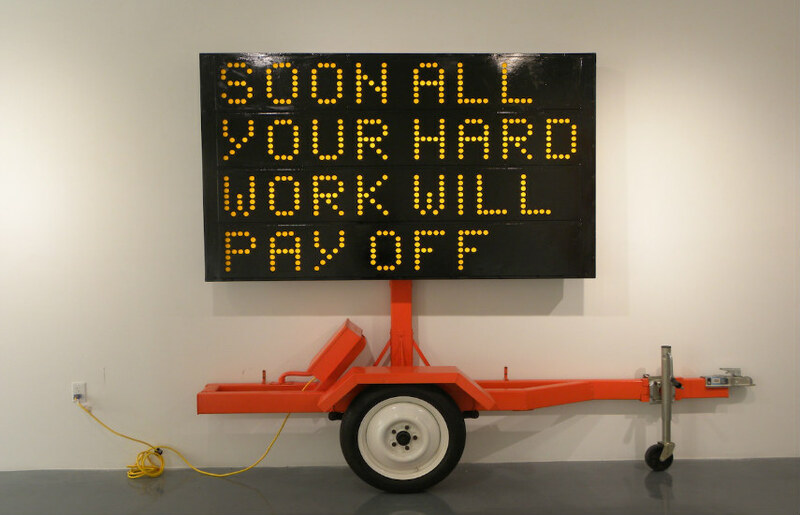 His gallery exhibition raises a philosophical theme in relation to street art. Some people think that transferring the work from the street to a gallery, the authenticity could be violated and the artist may lose the touch with their initial inspiration. But, on the other hand, there’s nothing wrong with being paid for one’s work. For understanding Clandestine Culture’s art, people must be familiar with society and social events. His work belongs to an urban art movement with a strong political message. Clandestine Culture uses everyday situations, common people, images and words with the aim to show that everyone is a part of one world culture – a Clandestine Culture. 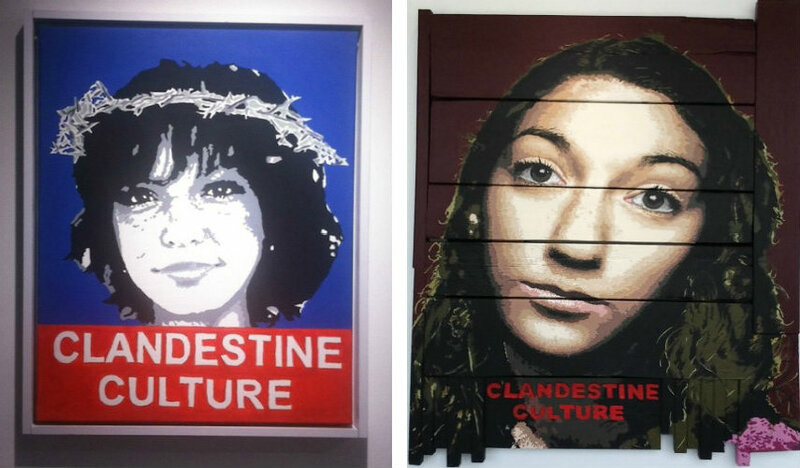 Clandestine Culture is represented by Gregg Shienbaum Fine Art.